My Web Host uses state of the art web hosting servers. Our customers love us for fast, quality service and pleasant customer service. My Web Host is an American company and our Web hosting servers are located in data centers in the USA. You will find that most of the companies that solicit you for cheap web hosting are located outside of the USA or they may be US companies that have their web hosting servers outside of the US. Most of them require one-year contracts which they charge to your credit card when you sign up. When these companies go out of business or just leave town with your money, there is no way to get your money back for the hosting that you paid for in advance – even worse – when these companies do go out of business, they leave people without any notice and without a web site and without e-mail. Don’t let this happen to you- it is important that your web site and that your e-mail remain up and running so that you can continue to run your business smoothly. My Web Host bills on a month to month basis. To protect your privacy. MyWebHost.com only bills using PayPal or you may pay by check or money order. My Web Host doesn’t ask you to sign any contracts. My Web Host has no set up fees. My Web Host has been in business since 1998. My Web Host ® is a federal trademark registered with the US government. We do not send spam mail to anyone. if you do business with companies that solicit you via email you are just encouraging spam mail. My Web Host does not sell your e-mail address or personal information to anyone. My Web Host DOES NOT PUT BANNERS OR ADVERTISEMENTS ON YOUR WEB SITE. Should you decide to cancel our services, you are free to cancel without any hassle to cancel – just e-mail us from your e-mail address that we have on file and we will cancel your service no questions asked. 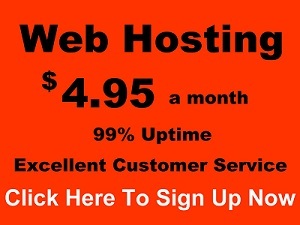 Why settle for less than My Web Host?